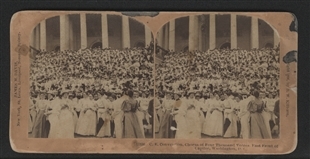 Some current events in the United States were of international interest, and this stereoview of Coxey’s Army—with caption information in six languages—is one example. During the 1894 financial depression, businessman Jacob Coxey led a group of unemployed men, some of whom are pictured here resting on their journey, to a protest at the Capitol, in hopes of persuading Congress to authorize a public works program to create jobs. 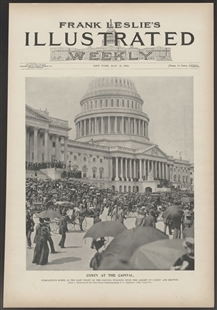 The march came to an end when Coxey and some of his followers were arrested for trespassing on the Capitol lawn.